If you own a iPhone and an iPad, you may have noticed the lack of a ‘clock’ app on the iPad. We get around it’s timing and count down features with other apps… usually more fun than serious work. For daily, weekly, and other alerts though, we usually turn to setting up a calendar event. You can set a calendar meeting and have it repeat, even with multiple alarms. Sadly though, if you want to do a week day wake up alert, or every Tuesday/Thursday alerts because those are early days, your out of luck. 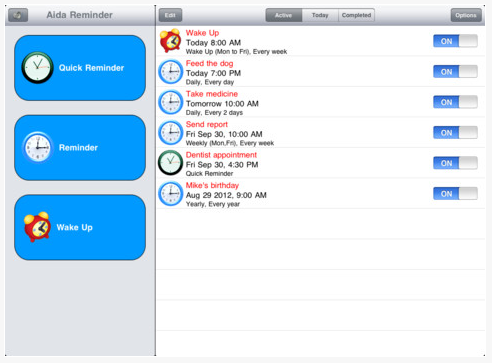 Using the built in apps on the iPad, you have to schedule each individual alert alarm. It appears the issue was shared across more people than any of us thought as it came up in a meeting and became a full room conversation while waiting for the meeting to start. One suggestion was an app called Aida Reminder. The universal app lays out nicely on the iPad as well as the iPhone. Aida Reminder is a Alarm/Alert stand alone app. It allows you to create alerts around a variety of calendar and timing needs without being over confusing to use. The UI upon launch, with it’s big buttons and colorful icons might not feel as serious as some ‘business’ app you have been using. Aida Reminder allows you to tune your Alerts (11 sounds available) so you don’t have days of alarms which ‘can be ignored’. There are six different categories to create alerts in: Quick Reminder, Daily, Weekly, Monthly, Yearly and a ‘wake up’ alarm (can have a ‘snooze’ time!). Each alarm can be recurring too, Aida Reminder allows you can set it to repeat every X days/weeks/months/years (for those every other week appointments) and you can set up on select days of a week or month too. Like the built-in calendar, your Aida Reminder alerts can have a pre-event reminder, handy for around the office so you have a heads up to a meeting that doesn’t happen every day. The Aida Reminder app developer mentions that app not needing Internet access to function which struck a couple of us as a funny thing to say. But, it was pointed out that it can be important since many apps are moving to the cloud these days and alerts are one of those things you don’t want to be limited to working only when you have Internet access!